This post has its origins in a mini-epiphany I had while driving up the main street of the town yesterday evening. To explain it requires a little background, not too much, bear with me. I lived in London for fourteen years. Great years. I was never one of those archetypal Paddies who cried into their inferior Guinness and pined for home. Naw-haw. Not me, I bloody loved the place. So why leave? Why come back here, to Ireland? Well, it was family, mostly, my new family. John had just been born and suddenly there was a desire, on both our parts, for him to have a shot at what we had – an Irish childhood, friendships, family, education. So we sold up and moved back to the West of Ireland. Not ‘home’ home, a new town, new people, but somewhat familiar territory nonetheless. Home Ground. Except it wasn’t. London had wreaked its changes on me and, although I had never lost my accent or my inherent Irishness, I had, I think, become somewhat detached from the place. For a long time, I felt an alien in my own country and I missed the things that I missed. This has very much faded over the years. John is sixteen now and he was only a baby when we all came back. I’ve settled back in very well. I have never been back to London since I motored off up the M1 in 1997 although my wife goes back every year. All is good. But a wee part of me misses London. I really lived it up for those fourteen years that I was there. I don’t mean in an extravagant ‘Champagne and Caviar’ style. I just mean that life was ‘Big’, you know? Some of it was brilliant and some of it was indisputably quite awful but it was all ‘Big’. And life outside London is smaller than life inside ‘London’ is. This isn’t a fact obviously, it’s just my own take on things, but that’s what I think and life has definitely become smaller. So, yes, I miss London. But then, when I think about it a little more, I start to realise that it isn’t London that I miss at all. I spent much of my Twenties and the first half of my Thirties in London and that’s the key to it all. It’s not London that I miss, it’s being in my Twenties and in my Thirties. It wasn’t really London that was ‘Big’ at all, it was those decades of my life. I think most-everybody’s Twenties and Thirties are Big and most everybody’s Forties, with the advent of kids and responsibility and such, is invariably that much smaller. So that’s quite the mini-epiphany, isn’t it? Except that isn’t the one I had last night while driving up the town. This one just ‘came out of the typing’, as sometimes happens. Back in 1987, Trish and I had gone to see a film in London (where we lived). 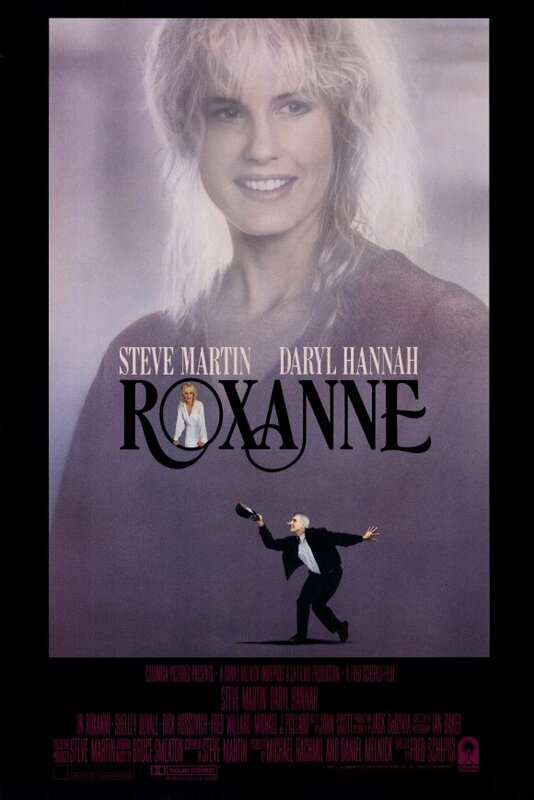 It was ‘Roxanne’. You know the one – Steve Martin does Cyrano De Bergerac, with the big nose and all. It was great fun and we enjoyed it. But, more pertinently, we had a chat after it and I only recalled this chat as I drove up the town yesterday evening, under all that half-hung red-and-green bunting. After seeing ‘Roxanne’, I remember saying this, “I love London, I do, but sometime, years from now maybe, I’d like to have what Steve Martin’s character had in that film. The small town, the community, a place where everybody knows your name.” I’m not kidding you or mis-remembering, I really said that. And last evening, it dawned on me that I’ve only gone and got exactly what I wished for on that evening twenty-five years ago. I got the dream. I now live in a nice tight little community who know me. Hell some of them even seem to like me. Visitors who walk with me through my town are often astonished at the level of interaction and greeting and fun that goes on, just with random people in the street. Yet again, my wishes seem to have come true. How bloody lucky am I? Fantastic piece. The most inspiring aspect being, that as human beings, it is invaluable to never forgot the choices we made and the realisation that with hindsight, we have achieved a simple, but nevertheless nirvanic state. I know that feeling, in spite of the fact I was born and raised in the same town. Stayed there after I married. Yep, you're right. We're lucky. I’ve been in a nostalgic mood of late. It started when I learned that the first girl I ever loved had died at the age of fifty-two and this started me down a road that I’ve found it hard to turn aside from and so I’ve decided to let it run its course. I mourned her loss even though I hadn’t seen her in twenty years, wrote a half-decent poem and felt better. Then when watching TV—an episode of Wallander actually—I saw a room full of reel-to-reel tape recorders and decided it was time to find one and listen to those old tapes I saved when mum died. And that’s what I’ve been doing for the past week, digitising them. There was a lot of rubbish there—old episodes of Randall and Hopkirk (Deceased), The Yogi Bear Show and recordings off the radio from 1973—but there have been a few gems too like a thirteen-year-old me doing my French exercises and recordings of the family from about 1964 and 1967. None of it made me cry which surprised me. I have led several different lives. In that respect I’ve been lucky. It’s usually meant going back to scratch and working my way up again (which is why I’ve never made much of a success career-wise) but that’s fine. In my travels online I did come across a few old school friends who are still living in the old town. Like the girl who died. I’m not saying she never went on holiday or anything but as far as I’m aware she lived her entire life in that area and never married either; she found religion instead. One of the people I looked up was my best friend who I’ve also not spoken to in twenty years. My daughter asked if I’d try and get in touch but I told her that we’d parted because our lives had headed in very different directions and they’d just kept on diverging; we’re further apart now than ever. He is where he planned to be. Even when he was at school he was very clear about where he saw his future and, as far as one can tell from what’s online, he’s made it; he owns a yacht for God’s sake. He would look at my life now and pity me. And yet I’m living the kind of life I always dreamed of. It took me longer to get here than I ever imagined but at least I got here before it was too late. Do I miss parts of my past? Yes. Even though I don’t wallow in it there were mes I enjoyed being. I have thought about moving back home—we have no ties here, it’s just an out of the way flat—but I think going back even for a visit would make me sad because, as my dad used to say, “It’s not places, it’s people.” Bearing that in mind we need to maximise the now. I have no recordings of my brother or sister where they’re older than four or five and no video whatsoever. There are photos but not so many. My best friend used to record everything. At the time I wondered when he took photos of empty rooms but now I see the sense in it. I used to think it would be easy to remember things. But it’s not. Once again you read my mind, and somehow voice some of the things I've been thinking about. It was returning to Norfolk from Newcastle for me. I lived and worked there and married, had kids etc. But Norfolk was a big miss, and my wife loved it having holidayed there as a child. The difference I think, for me at least, was that I did go back to my home town. And the familiarity - the cracks in the pavement, the peeling paint on the steps of the bank that still haven't been touched up - was coupled with the changes that had happened in my absence. I learned to love a place that as a youth, I couldn't wait to leave. Holly: Thanks. I might not go so far as to call it Nirvanic but I need to appreciate it a little more, for sure. Hope: Towns do sometimes get lost as they get bigger, don't they? Certainly to those who knew them when they were small. Jim: Yes, me and Gatsby (crosses fingers) like that... :) I loved that you're living the kind of live you dreamed of, that is something to celebrate indeed. Marc: What we need from a place definitely changes over time, as we do. Did the very same ourselves, Ken, and very happy to be here. Thanks for the post!